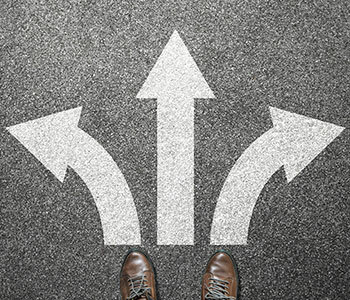 With so many options out there, how can you pick which career path is right for you? This can be overwhelming, but it is helpful to remember that there is no “perfect” decision, only one that is best for you given the information you know. Listed below are tools that could help you make the "best" decision for your career. Simplifying your career choices is one of the best ways to help make a decision. Consider narrowing your choices to only two to three. Moving forward with two to three choices will help because it is often too difficult to compare and contrast several choices. Too many choices are overwhelming and will most likely lead to paralyzing thoughts, which likely means no choice will be made. Before making any kind of choice, be sure you know what matters most to you. When deciding between your narrowed career choices, gather information about each one by focusing on what you value most. This could be things such as work/life balance, salary, growth potential, or job tasks. Once you sit down and decide what you value most and what you want out of a career, those items could help you best identify the career path to pursue. While you will be collecting information prior to making your career decision, it is important to accept that you will not know the outcome. You will only know the information about your choice that is available at the present moment. Do your best and try not to focus on the “what if’s”. Remember to focus on what you do know and make the best decision you can while keeping in mind that a perfect decision does not exist. While exploring what career is right for you, informational interviews can help make a decision. Reach out to individuals in the narrowed career fields you are exploring and ask if they would be willing to meet do discuss their career experience. Informational interviews will give you first hand knowledge about each career from those that have lived it. LinkedIn is a great resource for identifying these individuals. Remember, there is no “perfect” career decision and your AthLife Advisor is available to help you make the best decision for you.